・ When using a DENSHISUZU at home with a small child, please use it attached to things of size not to be swallowed. ・ Please do not fall from the height of 1.5 m or more. It may cause damage. 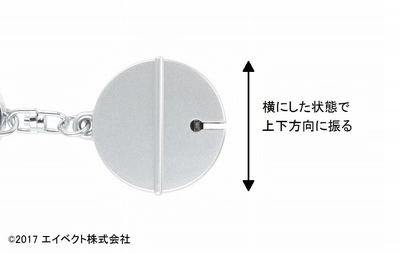 ・ During normal operation the LED will light up with shaking. Sometimes please check that it operates normally and the battery is not run out. The sound is generated by dropping for loss prevention. Note that DENSHISUZU prevents only the losses due to dropping, not the losses by leaving. 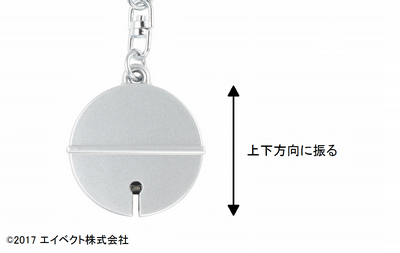 It is locked so that no sound is generated at the time of delivery when the product is shipped. To unlock, please hand at the portrait orientation and shake the Denshisuzu about 5 times in the vertical direction with the intensity that the LED lights up. If you hear a sound PIP ♪ unlock is completed and normal mode is activated. If you drop a DENSHISUZU, a sound will be generated. Normally, the sound will stop after picking up the DENSHISUZU or 1 minute has elapsed. If the sound does not stop after picking up the DENSHISUZU, please rotate it. To re-lock, please hand at the landscape orientation and shake the Denshisuzu about 5 times in the vertical direction with the intensity that the LED lights up. If you hear a sound E-D-C ♪ re-unlock is completed.